Although Texas has considerably warm winters, the swimming pool is still off limits for most families. The good news is we can still enjoy our backyards all year round. An outdoor fireplace adds a warm, inviting tone to your backyard. Your family can gather round and enjoy the evening together around the fire. Tell stories, roast marshmellows (yes, fireplaces work too! ), and create lasting memories that you and your kids will cherish for a lifetime. 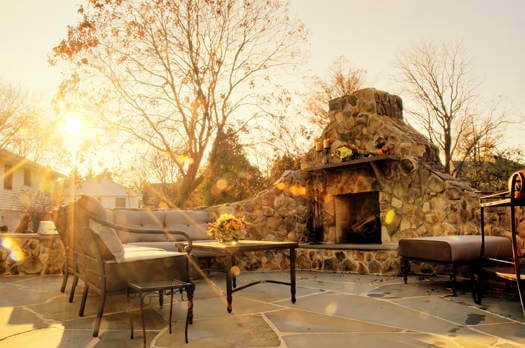 Outdoor fireplaces also add value to your home. It’s best to build an outdoor fireplace that resembles the style of your home for the most return on investment. You can choose from styles such as modern and sleek to Texan-chic. Once you have a style that matches your home, you can customize and individualize the outdoor living space with outdoor accessories that match your taste. When deciding to build an outdoor fireplace, browse online at other backyard structures for inspiration and ideas. We have a gallery to help you envision, or you can look at websites like HGTV. January is a great time to build a complete poolscape since most builders tend to get booked up in the later spring months. Get ahead of the curve and get started today. If you’d like a consultation to help you decide what’s best for your home and lifestyle, contact us today.